well you are out of luck because I have a ton of them today. 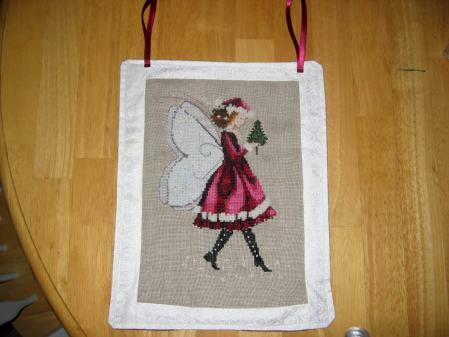 I have been busy this weekend stitching and finishing cross stitch projects. It was a blast! First, I finished up my portion of Nicole‘s RR. I am very proud that I got it done in time for the maildate this time. I hate being late on things like this. I stitched the May house from this website. It was a cute stitch. It is now packed up and ready to go out in the mail. I was going to go to the post office tomorrow, but then I realized I forgot to buy a card for the second package that I wanted to send out. They will both be ready to go out Tuesday and hopefully reach their destinations at the end of the week! Today, I spent some time in my craft room doing the finishing on some completed pieces that have been sitting in my stitching drawer for months. I finished both pieces as wall hangingings using a tutorial by Heather that I found through the Focus on Finishing blog. I messed up the ribbon hangers on both pieces, but I think I improvised well. I like how they both turned out. First is Just Nan’s Barnabee’s Quest. I have really been enjoying my stitching again, but one thing is getting in the way…my ever growing belly. It is quickly getting in the way of everything and I can’t sit as long in one place as a used to. Carol and my MIL asked for a pic, so I will have Allen take one when we get home from work tomorrow. Also on the baby front, Allen and I went to Babies R’ Us to start our baby registry and start formulating thoughts on what furniture we want to get. All I have to say is baby stores are increadibly overwhelming. It is so hard to know exactly what we need and what brands are good, etc. Leslie, would you mind e-mailing me your last name? My e-mail address is cruz.mama@gmail.com. Thanks! Hello, your cats are very cute, and i love your embroideries. Aww – such sweeties, even with the angry ears! 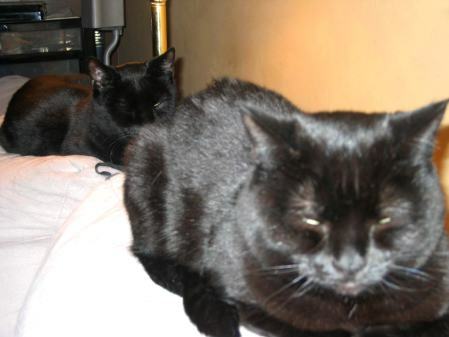 I love black cats. Your house for the RR looks fantastic. 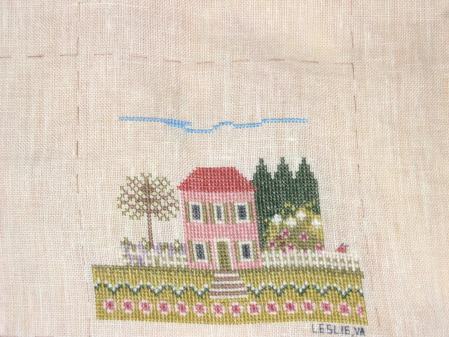 I am thinking about using one of these for one of the RRs I have to stitch on, they are such great houses! Your cats are adorable! I love the finishing – especially how the blue fabric brings out the blues in Barnabee! Your wall hangings look great 🙂 I am glad you could use my tutorial! Was adding the ribbon hangers confusing? Let me know if I can change the instructions at all for you! 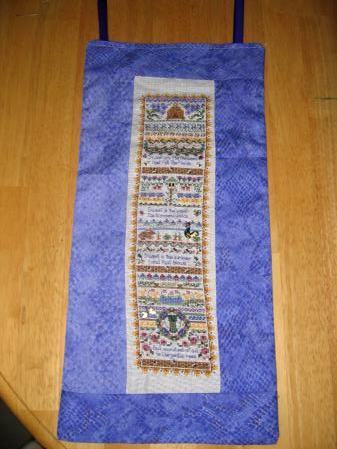 Your finishing turned out great Leslie, the fabric you used for Barnabee’s Quest couldn’t have been more perfect. 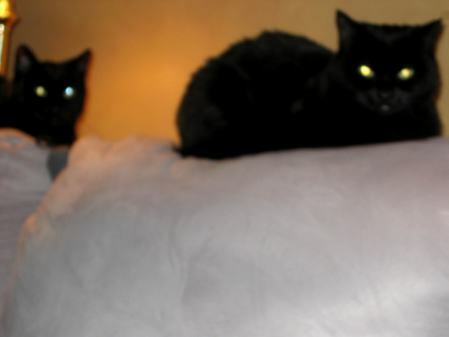 Your kitties are so cute – my Poppy could almost be their “twin”, lol. Lots of wonderful things in your blog, Leslie. I stop in from time to time to check up on you! LOL Your picture looks wonderful! I love your finishes, and your stitching is just beautiful. I think you have everything wonderfully in order, Leslie!! Great finishing! Your fur babies are so cute!